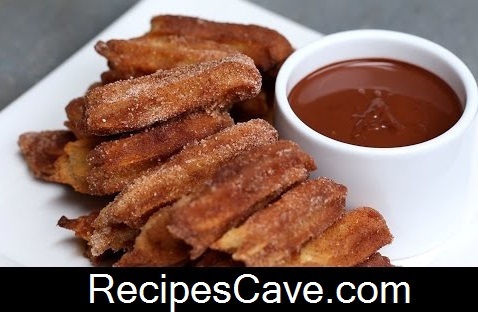 Easy Baked Churros Recipe - Many fastfood store keep it as a popular food, today we are going to share this baked churros recipe here follow these simple steps of cooking recipe. In a saucepan over medium heat, melt the butter and brown sugar in the water and bring to a boil. Take the pot off of the heat source, and mix in the vanilla, then the eggs one at a time. Transfer mixture to a piping bag with a 5 point, or star, tip. Pipe out thick 3-inch strips of churro batter onto a baking sheet covered with parchment, using a knife to release each piece from the piping tip, if needed. Bake for 10 minutes, then broil until golden brown. Dredge each churro in melted butter, then cinnamon sugar. Serve with melted chocolate if desired. Your Easy Baked Churros Recipe is ready to eat.